Imagine: a husband-and-wife team of filmmakers showcase their own school-age son as subject of a feature. Yeah, ultimate stage parents. Yeah, the kid stays in the picture, all right. Sounds like a real recipe for disaster, or have we all forgotten AFTER EARTH? 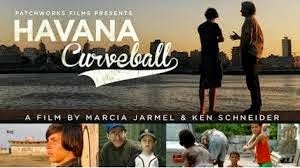 Still - coming along with exquisitely good timing courtesy the Obama Administration's moves to normalize relations with Cuba - movie couple Marcia Jarmel and Ken Schneider have done a lot more than make a glorified home movie with their modestly impressive short docu-feature HAVANA CURVEBALL. The San Francisco-based filmmakers' son and star is Mica Jarmel-Schneider. Shortly after his Bar Mitzvah, the school-ager wants to do something selfless and heroic that will mark him as a mensch. Combining his affection for baseball with concern over poverty in Latin America, Mica is struck by the plight of Cuba, a baseball-loving nation still subject to harsh, decades-old trade embargoes by the anti-Communist United States. Even Havana's top team has only one helmet among the lineup. First Mica rounds up a cache of donated bats and balls and tries to expedite them to Cuba via Canada (a reminder that Canadian filmmaker Michael Rubbo, back in the early 1970s, had the access to make the documentary WAITING FOR FIDEL, a rather arch send-up of the dictator and something of a precursor to ROGER & ME). When Mica can't confirm the arrival of his shipment, the boy and his parents (who wisely stay offscreen or in nonspeaking roles most of the time) personally visit the island, via a faith-based American charity organization. At last Mica is able to bring more gear, play in actual games on the taboo island, and meet Cuban fans and players - and it is quite amazing for us money-grubbing, celebrity-worshipping Yankee- imperialist pig-dogs, that even leading stars of Cuba's diamond have ordinary, comrade-in-the-street proletarian lives. Just like everyone else. Yet Mica also realizes the limits and fallibility of his one-mensch relief effort.